As part of the new Orvis Ultralight Wading System, the Men's Ultralight Convertible Wader is a remarkably versatile, innovative wader designed in a lightweight package without sacrificing durability and performance. Incredibly comfortable modern fit offers superior performance without the traditional weight and bulk. The Innovative suspension system uses FIDLOCK SNAP magnetic fasteners for quick and effortless waist-high conversion on warmer days and quickly reverts back to full chest waders in seconds. 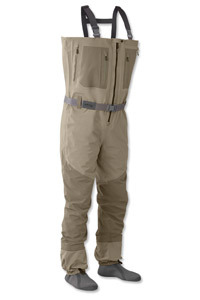 These men's fishing waders offer unmatched value and performance. The Encounter wader is the new standard for value waders. Built from a 4-layer nylon fabric that offers an optimum balance between durability and breathability. The fit has been revamped to match Orvis's award winning Silver Sonic family of waders, and they have added a number of features that provide the angler a better overall experience. These bootfoot waders offer maximum durability and traction. A fantastic, extremely durable value in a bootfoot wader. The new Encounter bootfoot is constructed from a 4-layer system comprised of a tightly woven 100% nylon fabric. Adjustable suspenders have "reversing" buckles, allowing the suspender to serve as a belt when the wader is rolled down to a waist high. The most versatile welded waders on the market today. Fish dry, and know you'll stay that way. Featuring the patented Orvis SonicSeam technology, all thread and stitch holes are eliminated and seams are double reinforced, prolonging the life of the waders dramatically. These are hard-wearing, everyday waders for the serious angler. Orvis's most technologically advanced wader is now available as a zip front wader. Silver Sonic Zippered Waders feature a full-length front zipper and are made of the same lightweight and durable 4-layer nylon fabric as their original Pack and Travel waders. Constructed with the patented Orvis SonicSeam® sonic-weld technology, all thread and stitch holes have been eliminated, with seams double reinforced.